We’ve been looking at various Android TV Boxes to determine the best of the large amount available. Our overall top pick is the NVIDIA SHIELD TV priced at $198.79. It’s an excellent all-rounder though the price may be a drawback for some buyers. Therefore, check out the other choices we’ve detailed for more good options. The world of Android TV Boxes can be somewhat bewildering, especially for beginners to the idea. But basically, an Android TV Box is a small set-top box that enables you to stream content to your TV through various media sources. This can be done either from local storage on your device or over the Internet, and other uses of these boxes include Android gaming, running ROMS via emulators, or browsing the Internet on your TV. While many people will have heard of boxes such as Apple TV and Roku, the open-platform appeal of Android TV boxes means they are becoming increasingly popular, with the choice of expanding all the time. All Android TV Boxes run the Android operating system although this can be in different forms. For example, some Android TV boxes run the Android TV OS, which has been designed specifically for remote navigation and for TV displays. These run apps specifically built for Android TV OS so other apps may need to be sideloaded, and it’s worth remembering that these are likely to have been designed with touchscreens in mind. Alternatively, some boxes run an Android OS version optimized for tablets and for full navigation you might require a third-party remote. It’s also worth pointing out that there is rather a gray area concerning some Android TV boxes. It’s worth sticking to names you know, as there are many questionable boxes that come preloaded with free content that may enter the realm of piracy. These may be appealing because of the functionality and services they offer but it can be better to opt for a box where you can either install the software yourself or a clean version of the software is pre-installed. For instance, popular media player Kodi is perfectly fine to use as long as the streaming content has been acquired legitimately. When purchasing an Android TV Box there are various factors that you should consider and work out which are important to you. First, you need to take into account what you most want to use it for. Many people, for example, are looking for a Kodi streamer or Download & watch free Movies but others might prefer a box for using standalone apps, while others still may want to focus on gaming. Other things to consider are the hardware itself, whether the box is 4K compatible if there are regular software updates, the variety of features, and the smoothness of performance. Also, some boxes may come with included peripheries such as a mouse or keyboard while with others have no extras. What are the best Android TV Box? Best Android Streaming Box Apps? There is a massive choice of apps for Android streaming boxes and the most well-known ones are compatible with both the Android TV OS as well as tablet-optimized Android versions. Names that immediately sprint to mind are Netflix, Amazon Video, Hulu, Kodi (XBMC), and YouTube TV while others include apps to watch Movies & TV Shows as the likes of Showbox, Sling TV, PlayStation Vue, Plex, Crackle, HopWatch for Reddit, and HBO Now. The choice is excellent and growing all the time and you’ll need to take a bit of time to peruse what’s available and find what’s best for your requirements. Excellent gaming capabilities are a big highlight of this one so there are no sacrifices to be made if you’re an avid gamer. Different configurations of this streaming media player are available so you can spend less. However, this bundle includes both a remote and a gaming controller and has built-in streaming apps including NVIDIA Games, Amazon Video, Netflix, YouTube, Google Play Store, VUDU, Plex, and more. It’s 4K compatible, is powered by the NVIDIA Tegra X1 processor with GeForce GTX graphics card, has 3GB of RAM, 16GB of storage (expandable via microSD although a Pro version offers 500GB if you want more), and features immersive Dolby Atmos and DTS-X surround sound. It runs Android TV OS and Google Cast with built-in Chromecast. The box weighs 250g and it measures 9.8 x 15.9 x 2.59 cm. The box also offers access to Kodi and packs plenty of other uses into a small package including Plex server use and music streaming. Excellent gaming capabilities are a big highlight of this one so there are no sacrifices to be made if you’re an avid gamer. NVIDIA GameStream allows you to cast games from a PC to a TV or you can use GeForce Now to stream PC games from the cloud. It’s also Smart Home Ready so you can perform functions such as adjusting the temperature, shuffling a playlist, dimming the lights, and viewing a Nest cam all by using your voice. There are hundreds of compatible smart devices available that can be used and wirelessly connected using SmartThings Link that turns the NVIDIA SHIELD into a Zigbee and Z-wave smart home hub. 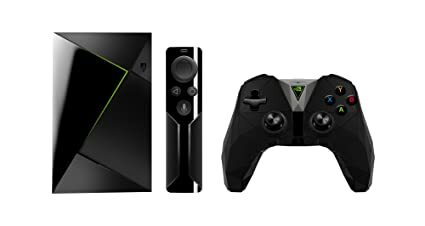 The NVIDIA SHIELD is at the higher end of the price spectrum for Android TV boxes but that’s about the only snag, and plenty of people feel it’s worth the extra money. It’s easy enough to use, though it’s worth saying that as it runs Android TV OS some non-Android TV sideloaded apps might perform erratically. In our usage the box worked smoothly and quickly, was simple to set up, and the sheer variety of features made it a winner. Other bonuses were the over-the-air (OTA) firmware updates and the fact that the remote and controller were both comfortable to handle. We also took a look at customer reviews and noted the vast majority were extremely favorable. Ultimately, it’s hard to find anything to complain about with the NVIDIA SHIELD and we had to pick this as our ultimate winner, especially for those who really enjoy a powerful gaming experience. Read on for alternatives though, including our runner-up, best budget choice and more. The obvious thing to highlight with the Amazon Fire TV is the much cheaper price, although just like the NVIDIA Shield it features Voice UI and a proprietary version of Android. Specifications include 4K Ultra HD and HDR compatibility, a speedy 1.5GHz quad-core processor, Mali450 MP3 graphics, 8GB of internal storage, 802.11a/b/g/n/ac Wi-Fi network support, and Bluetooth 4.2. The box measures 6.5 x 6.5 x 1.5cm and weighs just 87.1g. Features of Amazon Fire TV include Dolby Atmos audio, and it can be controlled with Alexa Voice Remote or paired with Echo for hands-free control. There’s also a micro USB port for power or the option of an Amazon Ethernet Adapter, with the latter recommended for users who want the reliability of the wired Internet. If you want to place Fire TV at a distance from the TV you’ll require an optional HDMI extender. The device offers access to over half a million TV shows and movies with more than 200 integrated channels and apps such as Prime Video, Netflix, HBO, Showtime, NBC, and Hulu. Users can find what they’re looking for with universal voice search or the home screen can offer personalized recommendations about new content. Internet browsers such as Firefox and Silk can be used to navigate websites including Facebook, YouTube, and Reddit and more. If you’re an Amazon Prime user you can also access Prime Music with millions of songs available, all without annoying ads. The set up is quick and simple as you just plug Fire TV into your HDTV, plug it into a wall outlet, and then connect to the Internet. The user-friendly interface is another big positive and the design of the box means it can be positioned behind your TV so it’s very unobtrusive. It’s worth noting that we had no problems with setting up the box or with performance though we noticed some isolated negative user reviews. However, the majority of these were to do with setting up issues that were soon resolved. It’s worth saying that Amazon recommends using the included power adapter as there may be some issues playing 4K content if you are using the TV to power Fire TV. 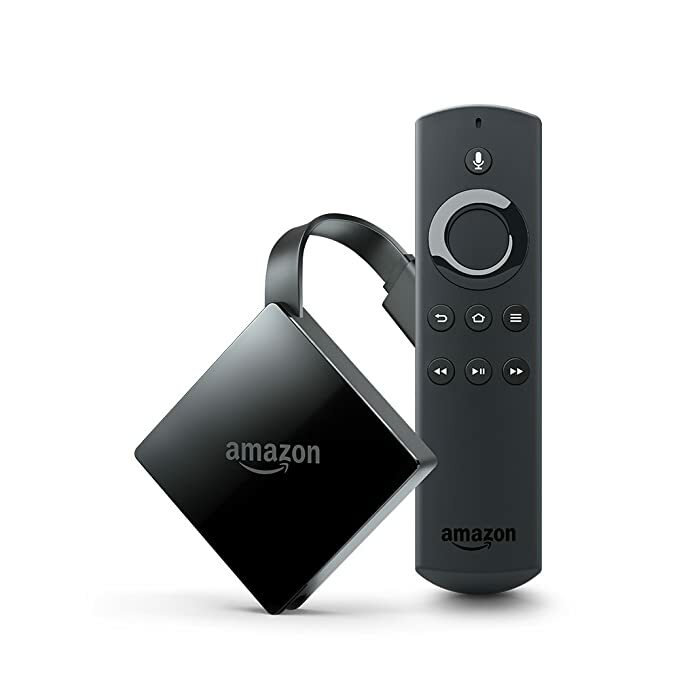 Overall, we feel that Amazon Fire TV is a solid offering with ready availability that will suit many people looking for a decent Android TV box. You can enjoy a variety of content with apps such as YouTube, Netflix, FandangoNOW, SlingTV and more, or Google Cast from your preferred devices. There’s plenty to recommend about the Xiaomi Mi Box such as support for 4K Ultra HD and HDR. We should say though that some users report 4K streaming at 60Hz can be patchy but in this case, a serviceable option is to drop down to 30HZ. Further specs include 2GB of RAM, 8GB of internal storage, and a quad-core processor. It runs Android TV 6.0 and supports Wi-Fi, Bluetooth, and HDMI 2.0a with speeds up to 18Gbps, therefore offering improved sound and picture quality. You can enjoy a variety of content with apps such as YouTube, Netflix, FandangoNOW, SlingTV and more, or Google Cast from your preferred devices. The Mix Box also offers Voice Search Remote, and with a price less than half of the Nvidia Shield it’s a viable budget option. Kodi fans will appreciate that the WeTek Hub comes with Kodi (formerly known as XBMC) pre-installed. Kodi fans will appreciate that the WeTek Hub comes with Kodi pre-installed. It’s a powerful device that supports 4K streaming although unlike some boxes it doesn’t run Android TV OS, instead opting for an Android version optimized for tablets. 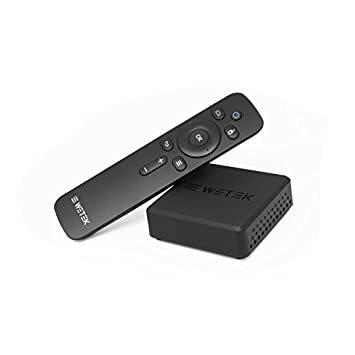 That means that some Android TV apps won’t work as smoothly but if you can get past that the WeTek Hub has enough about it to be included among our choices. Specs include HDMI 2.0 input up to 4K @ 60HZ with HDCP 2.2 and H.265 10-bit support, a 2GHz quad-core processor with Mali-450MP graphics, 5.1 Dolby and DTS, and Bluetooth 4.0 for connecting to peripherals such as a keyboard or speakers. It also supports Microsoft Play Ready and Widevine Level 1. A neat feature is an external InfraRed port enabling it to be mounted and hidden behind your TV set. It can also be paired with the WeTek Gaming Pad (sold separately) with access to a huge library of Android games. The plus point is that it’s bundled with the Minix Neo A2 Lite, a gyroscopic mouse with dedicated multi-media playback controls, a QWERTY keyboard, and a built-in IR transmitter. The Minix Neo U9-H is described by its makers as the ultimate home theatre experience. We might not go quite that far but it’s a device that’s rich with features as well as great picture quality and it definitely deserves a place as one of our choices. It supports a wide variety of formats, is 4K UHD and HDR-compatible (HDR technology enhances the color spectrum to give more vibrant viewing), and features Dolby Digital Audio for cinematic surround sound. Further features include 802.11ac 2.2 MIMO dual-band Wi-Fi and Gigabit Ethernet meaning stuttering is kept to a minimum. Also included is licensed support for Google Widevine Level 1 and Microsoft Play Ready 3.0, digital rights management schemes for improved content protection. 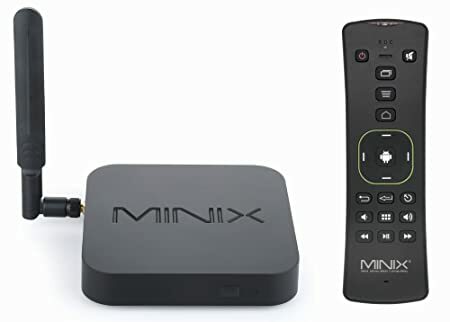 Another plus point is that it’s bundled with the Minix Neo A2 Lite, a gyroscopic mouse with dedicated multi-media playback controls, a QWERTY keyboard, and a built-in IR transmitter. Specs include a 64-bit octa-core processor, 2GB of RAM, and 16GB of internal storage. 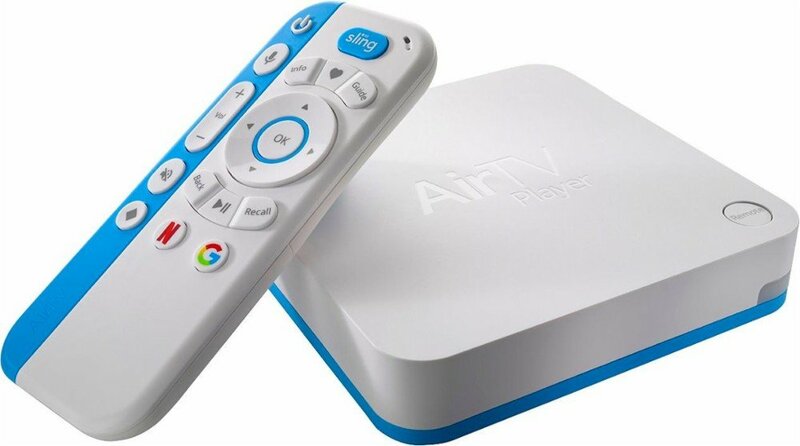 A further choice for cord-cutters is the AirTV streaming media player, a mid-priced more basic device. Specifications include 2GB of RAM and 8GB of internal memory, and as well as watching streaming channels it includes a TV tuner (antenna required) for live TV. Although the specs are on the average side, a good point is that it runs Android TV OS. However, for buyers for whom gaming is important, this might not be such a good choice. Another thing to mention is that we weren’t too struck on the white design with blue color accents and thought it looked more like a toy, though that’s very much down to personal taste. User reviews range from 1-star to 5-stars but we found it worked pretty well so consider it a viable option. The most selling device like the Amazon Fire TV (detailed above) it offers Alexa Voice Remote at a very affordble price, though it’s not as powerful as the 4k version. Although not strictly an Android TV box, we felt the Amazon Fire TV Stick (an HDMI dongle) should be included for those who don’t want to splash out too much cash or simply don’t want a box in sight. 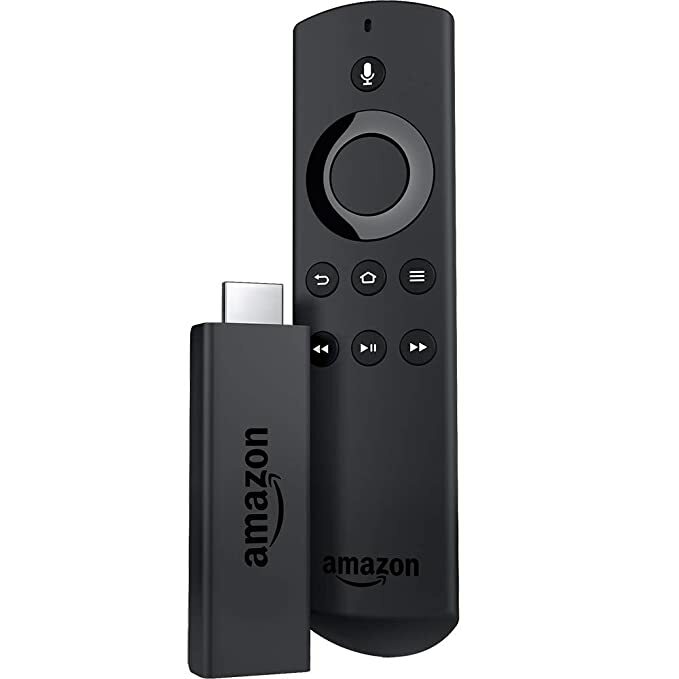 Like the Amazon Fire TV (detailed above) it offers Alexa Voice Remote, though it’s worth saying from the start that the Fire TV is 40% more powerful than this stick version. The Fire TV Stick has 8GB of internal storage and a 1.3GHz quad-core processor, although another thing to consider is that it doesn’t support 4K Ultra HD. However, it still has plenty to offer, with access to thousands of channels and millions of websites, and like Amazon Fire TV it’s well suited to Amazon Prime members. All of the above have a variety of different features and specifications, so as with any other household device or gadget, finding the right one for your needs means you really have to decide on the factors that are most important to you. In our look at the best Android TV Box 2019, we’ve aimed to give suggestions for all requirements and pockets. If you have enough money to spend then we really can’t fault the Nvidia Shield, which is why it was awarded our top spot. Regular OTA updates that automatically install also make this a really appealing device, as well as microSD expandability. On the other hand, the Amazon Fire TV is much less expensive and for Amazon Prime members especially, the competitive price makes this a great pick. The price of the Xiaomi Mi Box is also a great draw, particularly when considering what it offers. Another thing to take into account is to consider what software is pre-installed or compatible. For example, much of the appeal of the WeTek Hub is that it comes already loaded with Kodi. Also, you should consider whether the TV box you’re looking at comes with any extras, such as the gyroscopic mouse that’s included with the Minix Neo U9-H.
Generally, while it’s possible to sideload some apps, they may not work in quite the same way and might require the use of a mouse to navigate, and some users might not feel confident in the process. Of course, the design is also a factor and although these are all basically boxes, some are definitely easier on the eye than others. We thought the budget-priced Mi Box had a nicely streamlined design. If you’re still not sure or are worried about the initial setup, why not check out the cheap Amazon Fire TV Stick (the most popular on Amazon) to start with before investing on a more sophisticated box. Please note that all of the above prices were correct at the time of writing but are subject to change. It’s important to do your homework before making your ultimate choice, as the market is flooded with third-rate Android TV boxes that should be avoided. Try to stick with a name you’ve heard of and trust, and remember, if it seems too cheap there’s probably a good reason for that. Finally, we urge users to be accountable about the way content is accessed. Different laws apply in different regions, and the user has a responsibility to access content legitimately. 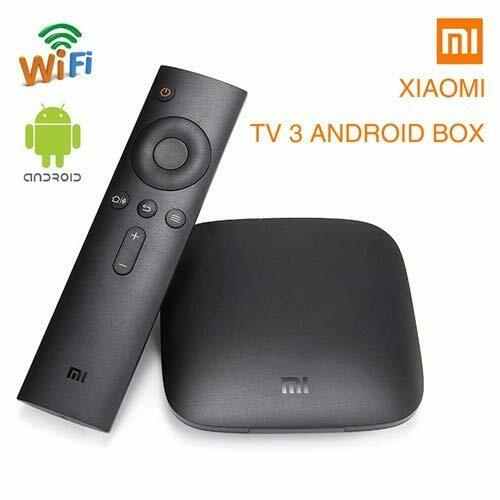 One thing for sure is that a good Android TV Box is a great way of accessing your favorite TV shows, movies, games, and music. Once you start you’ll soon be wondering why you didn’t have one before!